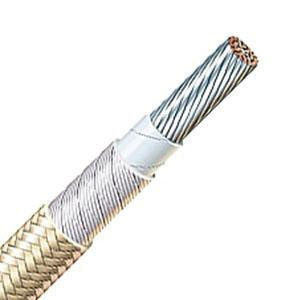 Omni Cable 10-AWG TGGT Lead wire in tan color, withstands voltage rating of 600-Volts. This copper wire has 0.011-Inch polytetrafluoroethylene tape with glass serve insulation. It has fiberglass braid with high temperature finish jacket. Wire is suitable for use in equipment wiring in iron/steel mills, cement kilns and glass plants. It withstands temperature rating of 250 deg C. Motor lead wire is UL listed.